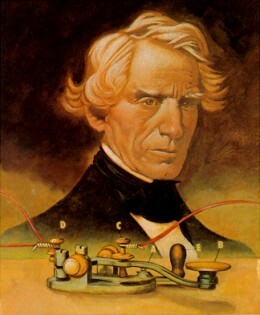 Starting in 1836, the American artist Samuel F.B.Morse developed the forerunner to modern International Morse code. 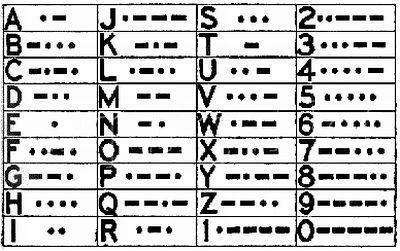 The original Morse Code was inadequate for the transmission of much non-English text, since it lacked codes for letters with diacritic marks. To remedy this deficiency, a variant called the International Morse Code was devised by a conference of European nations in 1851. This newer code is also called the Continental Morse Code. 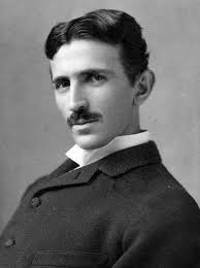 After continued research, Nikolai Tesla presented his ideas on wireless communication in 1892 and further expanded on them in 1893. Guglielmo Marconi, an Italian inventor, arrived in Britain in 1896, determined to develop Hertzian Waves - an electromagnetic wave, usually of radio frequency, produced by the oscillation of electricity in a conductor - into a commercial system from which he could make money. 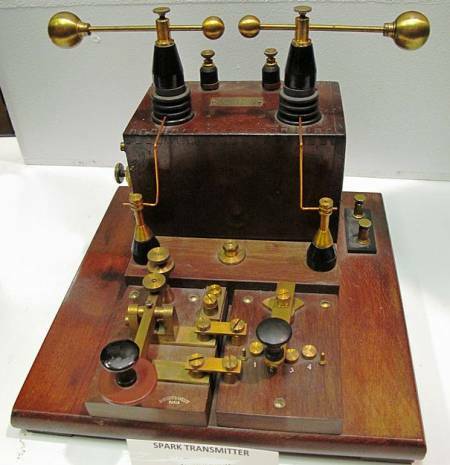 With an extensive network of telegraph cables already encircling the globe, he realised that a wireless system would be in direct competition with these well-established landlines. 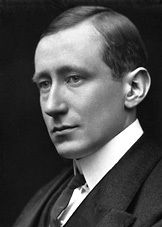 Marconi directed his early efforts at developing a wireless telegraphy system for maritime use, reasoning that with the ever increasing number of people travelling the oceans of the world, he would be able to make his fortune. 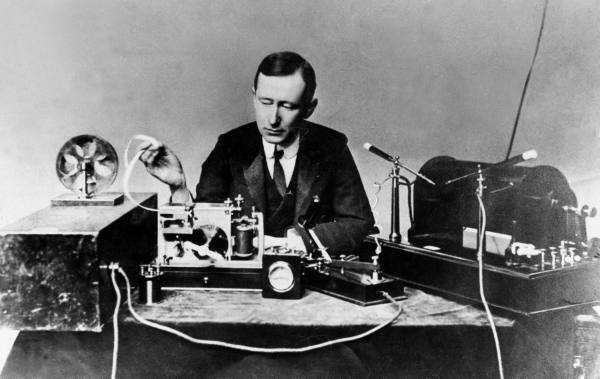 Marconi's 'Wireless Telegraph and Signal Company' was formed on 20 July 1897, after the granting of a British patent for wireless in March of that year. In 1899, experiments with his wireless communications system on board the liner St Paul, followed by the ss Philadelphia some three years later, heralded the introduction of Marconi wireless telegraphy systems at sea. 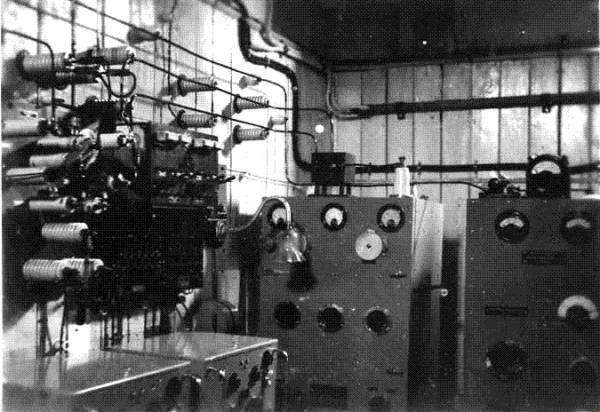 Systems that were to operate until the introduction of modern geostationary satellites, which eventually rendered the ship's highly skilled Radio Officer redundant. 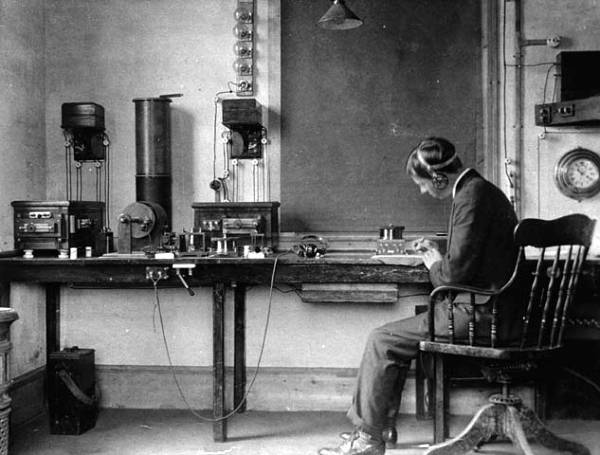 In 1909, Guglielmo Marconi shared the 1909 Nobel Prize in Physics with Karl Ferdinand Braun "in recognition of their contributions to the development of wireless telegraphy". 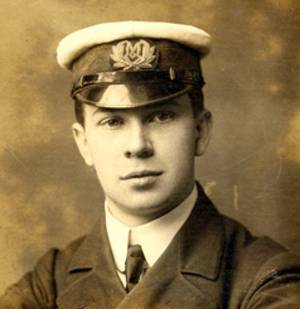 The most famous of all the Marconi men, Titanic's heroic Senior RO, Jack Phillips, aged 25. A reconstruction of Titanic's radio office, from the James Cameron movie..
Radio Officer Jack Phillips in the Titanic's Radio Office. 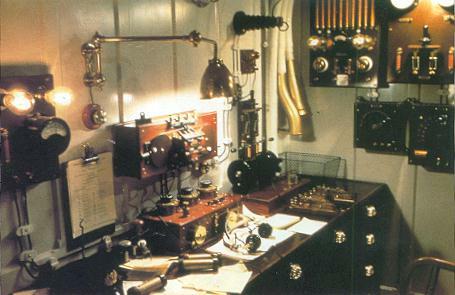 The Marconi equipment was delivered to Titanic in time for sea trials on 2nd April. Jack Phillips and his deputy, Harold Bride, spent the day completing the installation and adjusting the equipment. They exchanged test calls with coast stations at Malin Head (North coast of Ireland), callsign MH and Liverpool, callsign LV. 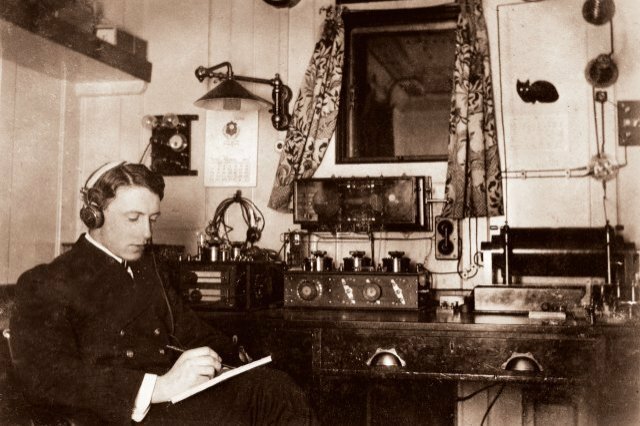 By this stage, the Marconi wireless was in almost constant use, with sea trial reports flowing from Captain Smith to Bruce Ismay, the White Star Line's Managing Director in Liverpool. By the following day, the equipment was adjusted and working correctly - Phillips and Bride exchanged messages with coast stations at Teneriffe - some 2000 miles away and Port Said - more than 3000 miles distant. A Marine Auto-Alarm set, designed and manufactured by the Marconi International Marine Communication Co. Ltd., c. 1920. This system was just one outcome of the Titanic disaster. If a ship had only one wireless operator, he could sleep without fear of missing an emergency message. 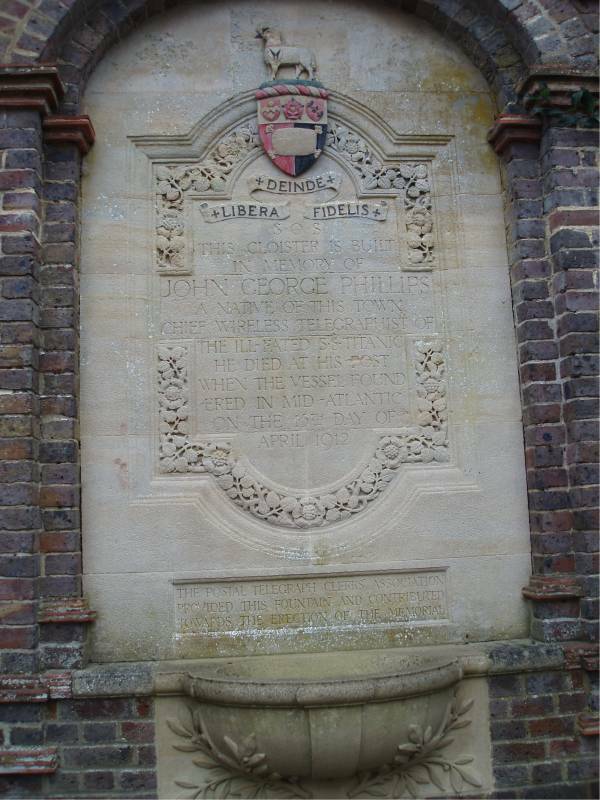 The Jack Phillips memorial and cloisters at Godalming, where Jack came from, after attending a local school in Farncombe. The memorial is a fitting tribute to Jack, probably the most famous Radio Officer of all time. In the Godalming Museum, they have a corner dedicated to Jack, where people come from all over the world to visit. Photograph and details courtesy of Ted Sapstead, P&O Engineer Officer 1957-1962. 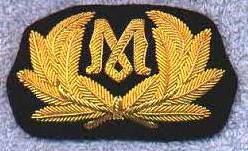 A Marconi M.I.M.C. Co. Key Type 365A Key, serial number 4448, late 1930's, from the ss Strathmore, callsign GYMS, 1930's. Note: In September 1939, Maloja was converted to an armed merchant cruiser in Bombay. As part of the conversion the after dummy funnel was removed, the radio room demolished and a new W/T office set up in the space under the bridge. The above photograph was taken after the conversion. She commissioned as HMS Maloja on 24th November 1939. Marine radio played a vital role in WW2 - the war provided a great boost to radio technology in general. 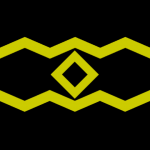 Amongst other things, WW2 introduced direct bridge to bridge communications, through the use of what was to become the marine VHF radio band - known during the war years as "talk between ships" (TBS). 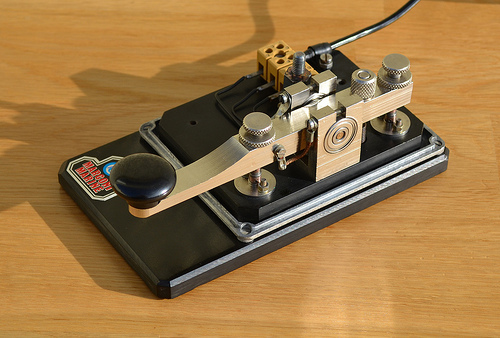 By the late 1970's, despite tremendous general advances in communications, Morse Code still ruled the marine radio waves. 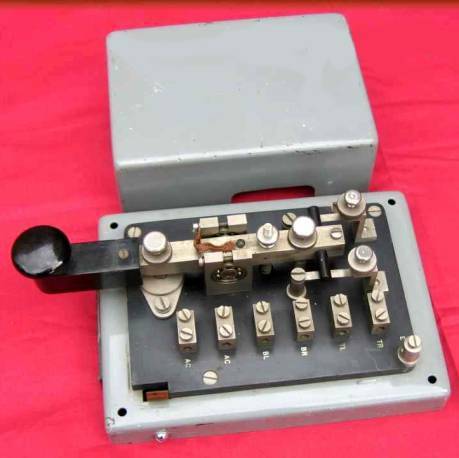 Radio Officers sent distress messages by Morse Code (or radiotelephone) in the hope that another ship or shore station would hear the call and respond. In 1979, the International Maritime Organsiation Assembly decided that a new global distress and safety system should be established, in conjunction with a coordinated SAR- Search And Rescue infrastructure to improve safety of life at sea. And so was born the Global Maritime Distress and Safety System (GMDSS). Designed to automate a ship's radio distress alerting, it removes the requirement for manual watchkeeping on marine radio distress channels. The new system is quicker, more efficient and reliable than the old manual Morse Code and radiotelephone alerting systems. The basic concept of the GMDSS is that Search and Rescue (SAR) authorities ashore, as well as shipping in the immediate vicinity of the ship or persons in distress will be rapidly alerted so that they can assist in a coordinated SAR operation with the minimum of delay. Sparks would have to monitor the 'traffic lists' from a number of shore stations, where all ships that needed to receive messages had their call signs listed in alphabetical order. If a ship heard his call sign, the radio officer would then try to contact the shore station in order to get the 'traffic'. It was often a lengthy procedure, and seldom could you send out a query and get an answer back in the same day. 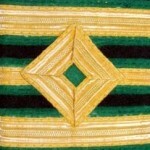 The ship's captain had to be trusted to conduct business with little real-time input from the company. 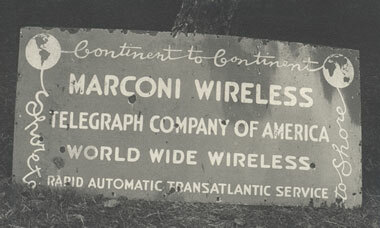 The Marconi Wireless Telegraph Company Limited was pre-eminent. Formed in London in 1897 by Senor Guglielmo Marconi who opened a factory in Hall Street, Chelmsford, Essex in 1899, employing 26 men in the manufacture of wireless telegraph equipment, under the Company's trading name 'The Wireless Telegraph and Signal Company Limited'. 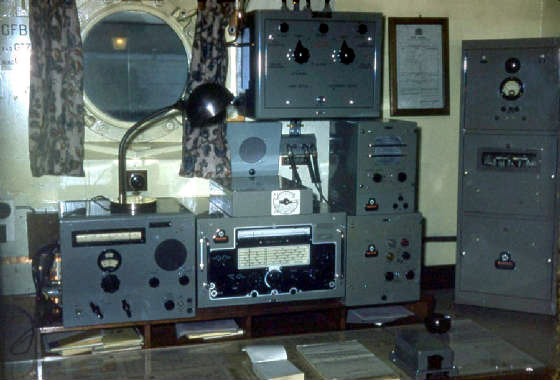 The radio room of P & O's ss Devanha call sign GFBR in 1957, with a CR300 receiver on the left. 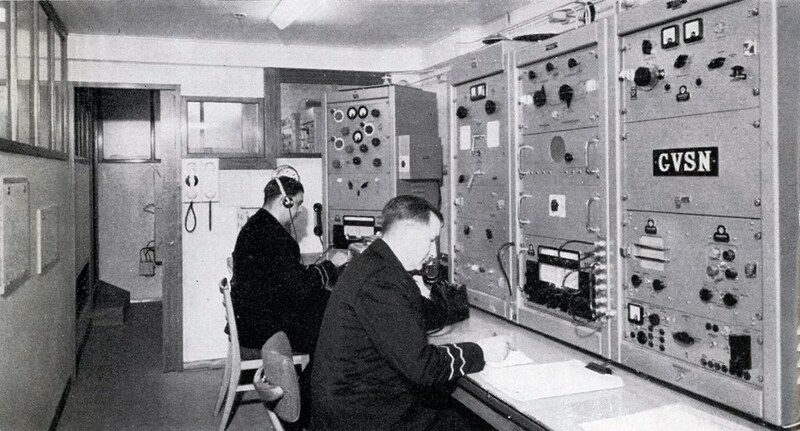 ss Oriana's Marconi Radio Officers in the early 1960s. P&O Liner Oronsay, GCNB ~ Marconi RO Derek Rice at the W/T operating position in 1969. 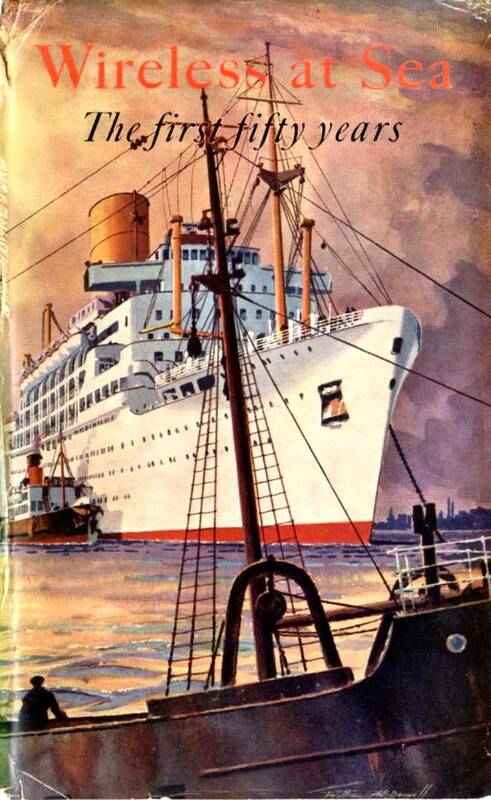 P&O bought out the remaining stake in Orient Lines in 1960 and renamed its passenger operations P&O-Orient Lines. 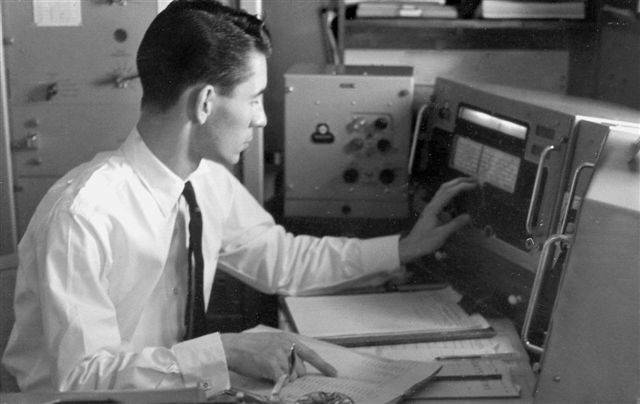 Unlike P&O passenger ships, Marconi Radio Officers continued to be employed aboard Oriana, Orsova, Oronsay and Orcades, P&O having dispensed with Marconi Radio Officers on board the Company's ships in late 1953. 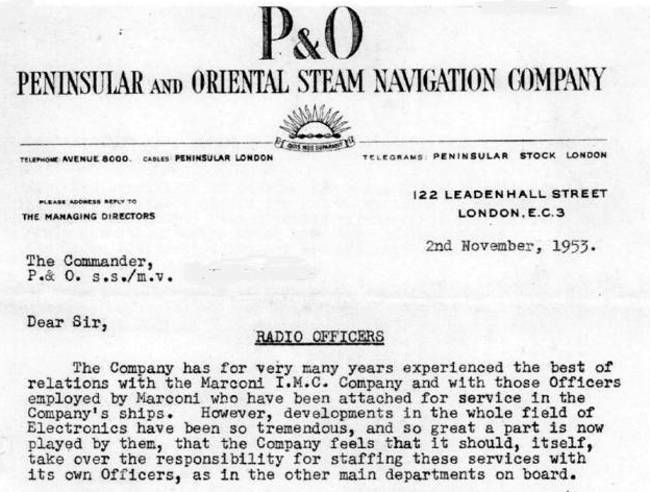 At that time, Marconi Radio Officers serving on board P&O ships were given the opportunity to transfer to P&O. 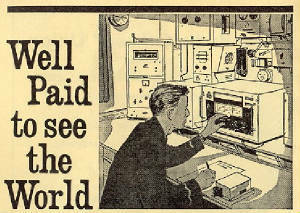 "Short training period, low fees" - so went the advertisement for Colwyn Bay Wireless College in Practical Wireless, Radio Constructor and Wireless World in the 1950s. "See the world on full pay" was another. 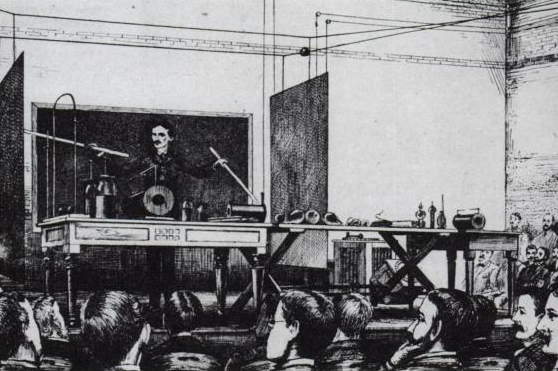 The glossy brochure for the Glasgow Wireless College at Charing Cross showed a young lad with wavy gold braid on his sleeve reaching up to tune the Marconi 'Oceanspan' transmitter. 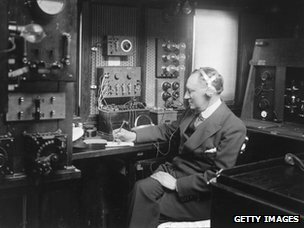 With his hand on the key the caption read, 'With the world at his fingertips a Marconi Marine Radio Officer prepares to send a message'. All very enticing for a young man hankering to see the world without having to 'climb the rigging' or 'swab decks'! 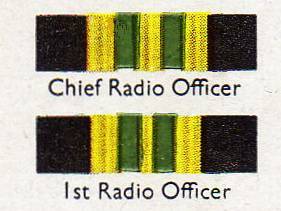 The Radio Officer not only operated the radio equipment, but also repaired and maintained it. The companies that built and supplied the electronic equipment, and in many cases supplied the skilled Radio Officers to the shipping companies, also had their own technical staff based at various seaports. During the golden age of maritime communications the globe was populated with hundreds of coast stations, each with its own area of coverage, call sign and personality. 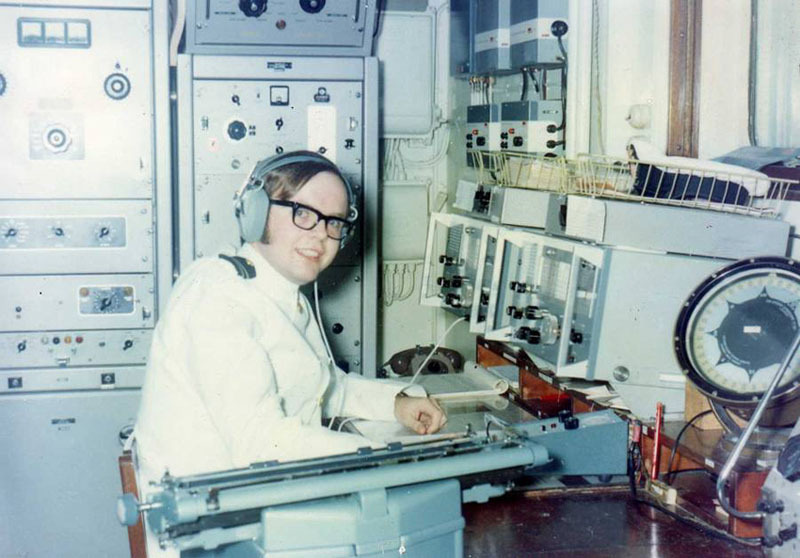 Many Radio Officers will remember tuning across the marine bands and hearing these stations, standing shoulder to shoulder with hardly any space between them, calling out for traffic or working ships. 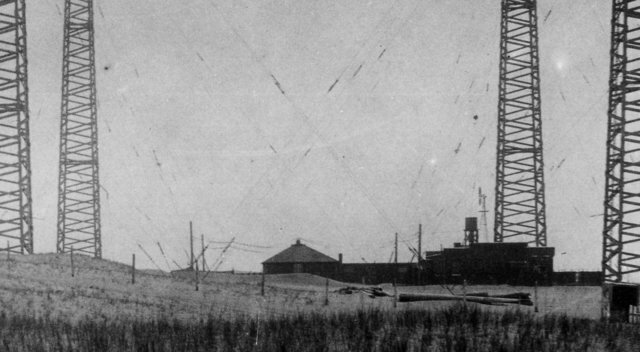 Cape Cod began as Marconi station CC established in 1903 in South Wellfleet. The famous four legged Marconi towers were a primary feature of the station. 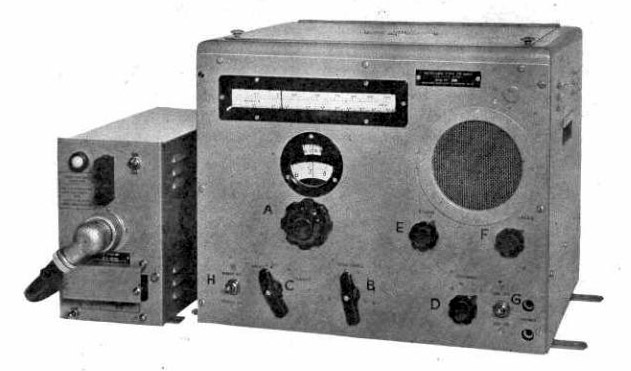 In the 1930s they were known as Marion Radio, operating on 117kc, 129kc, 141kc, 143kc (later 147kc) 406kc and 500kc as well as twelve frequencies in the HF bands. The site of the original station has almost completely disappeared into the Atlantic due to erosion. A history of marine wireless communication, published by the Marconi International Marine Company Ltd, to mark their silver jubilee. A wonderfully informative book with an outstanding collection of images. There are 80 illustrations, mostly photographs. Stories and pictures about the British Merchant Marine seen through the eyes of Radio Officer Alan Patterson. His diaries take us from 1938 through to the end of the war. Alan and his crew managed to escape submarine wolf packs several times. On one especially dangerous run near India, he discovered that the fine bunch of courageous men from the ship he had just left had been blown to bits while returning to India on a British India vessel loaded with munitions.